So, Rheumatoid Arthritis rears its ugly head again. I knew it, deep down inside. I can feel when it’s stalking me. And it has been for weeks now. My right hand has been basically useless. I can type with nine fingers, but holding a pen in that hand, Aaiiyyy! Still my heart sank at the thought of it being RA. I’d been doing so well. “You sure it’s RA?” I asked. “Even if it’s unilateral?” RA usually attacks both sides of the body equally. It is its well-known calling card. “What we need to do is start Prednisone,” he said. He laughed again as he examined my joints, bending my arms and legs every which way. No problem there, yet. I’d first been seen by the Physician’s Assistant, as is the usual routine for my rheumatology visits. He and the rheumatologist are like an extension of my family by now. He tried to examine my hand, but I held it out of his reach. I was afraid to let him, or anyone, touch it. “It might be the tendon that’s inflamed,” the PA said. Trigger Finger, he called it. “He might give you a shot,” he went on. With that, I placed my hand in his and he very gently manipulated my index finger. It could bend at the second joint, but not at the third, which joins the finger to the hand. He turned my hand over and pressed on my palm. I tensed up, but there was no pain. “When you make a fist, does it hurt?” he asked, making a fist of his own hand. “I can’t make a fist,” I told him and flexed my fingers, minus one. “You might get a shot,” he repeated. He shrugged and left me with the dreaded vision of a needle in my hand. I tried to relax and read while I waited for the doctor. I made up my mind I would do what I had to do to stop this pain. I couldn’t bear it anymore and there are so many things I need to do, like finish the quilts I have pending. The doctor came in happy and upbeat as usual. He didn’t even try to touch my hand, one look sufficed, and there was no talk of needles. After reviewing his notes from my last visit and my lab values, he bade me step up on the exam table. “I know,” I said. I’d been so happy to go down to one 2.5 milligram weekly pill and looking forward to one day taking none. Now I could kiss that dream goodbye. And I had been. It was a valiant effort to try to get off that drug, but I must face facts. There is no end to this disease and no end to the vigilance required. I smiled back. You can bet your bottom dollar I will keep that handy. No more three consecutive weeks of suffering for me. I’ve got things to do!!! This entry was posted in Coping, Dealing with disease, Humor, Resilience on March 15, 2012 by Irma. Seems wrong, somehow to click on ‘like’ for this post, but I wanted you to know I liked the way you wrote it, while disliking the disease. 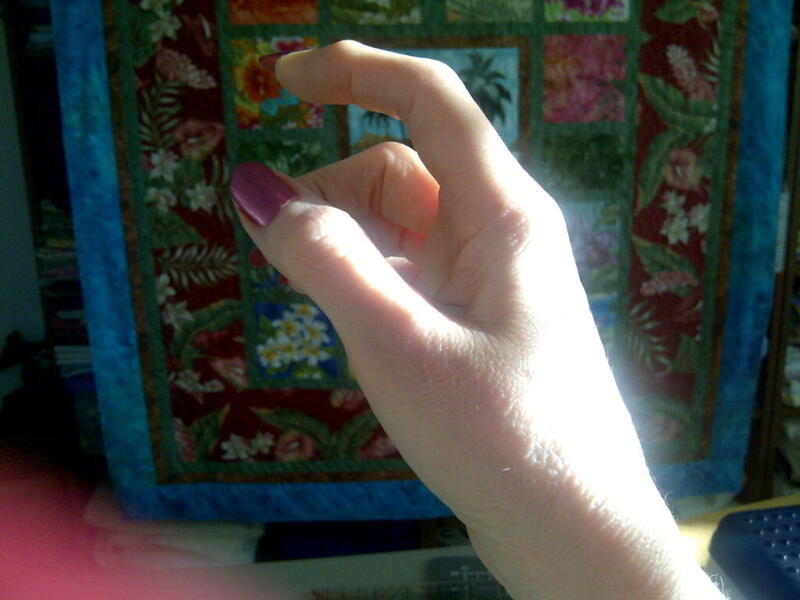 My right index finger is the worst one, too, though the other is well on its way. So I do understand your pain and your frustration. But we’ll soldier on till we just can’t anymore, won’t we? Hope you get sufficient pain relief to get your quilts finished….and some! Thank you, Christine. I know what you mean about the “Like” button. Sometimes I wonder if I should “Like” something due to its subject matter, but it’s a way to support the writing, and the writer, I think. The problem with RA is that it strikes and then retreats. You just never know when! I am doing very well, as my doctor tells me each visit. And with his guidance and support I follow a regimen that minimizes my symptoms, until it doesn’t. Then we regroup and shift things around. I hope you are able to continue with your writing as long as you want to. © 2011-2018 Irma Navarro. All rights reserved.